In this article, I will focus on how to use COUNTIF function in Excel. The purpose of COUNTIF is to count cells that meet a single criteria. If you need more criteria in your formula, then COUNTIFS function is a much better option. COUNTIF syntax is the same in all Excel versions. 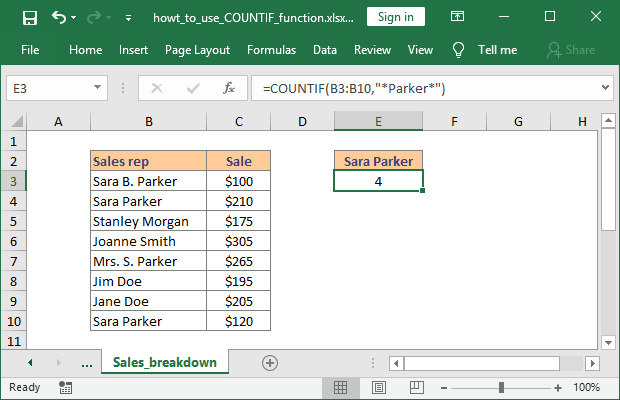 This means that you can use any of the examples shown in this article in Excel 2016, 2013, 2010 and 2007.
range – The range of cells you want to count. Range can contain numbers, arrays, a named range, or references that contain numbers. Blank values are ignored. criteria – The criteria used for counting. This can be a number, expression, cell reference, or text string. COUNTIF is not case-sensitive and will treat all text the same way. This means that using “Orange”, “orange” and “OrAnGe” will return the same result. However, you can combine COUNTIF with EXACT function if you are looking to apply a case-sensitive criteria. Note: Since the operators need to be entered as text between double quotes (“>=”, “>”, “<=”, “<>”), we have to use the ampersand symbol (&) to concatenate the operator with the criteria cell. If you skip this step, Excel will not be able to understand your formula and will display an error message. The following image shows you the basic use of COUNTIF. 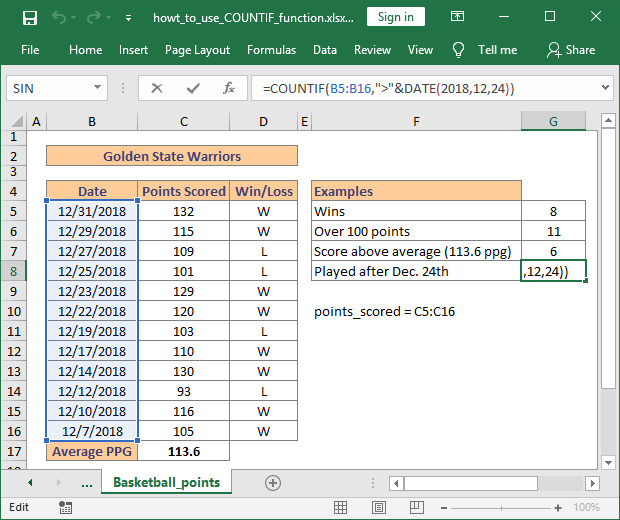 In the table I have entered the last 12 games played in 2018 by the Golden State Warriors (NBA team), the points scored in each game and the result. 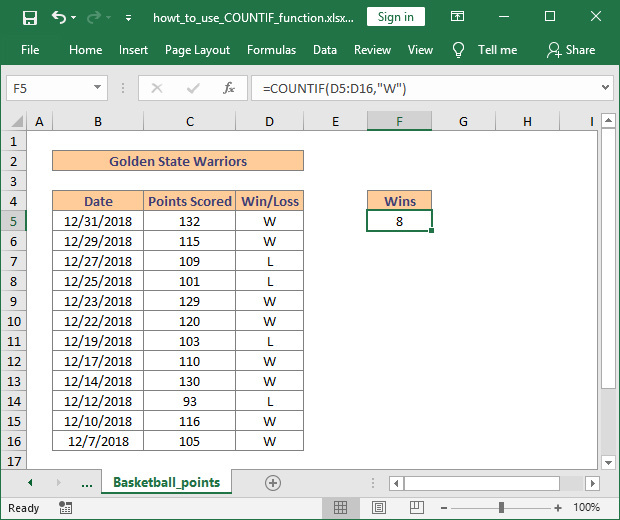 The formula =COUNTIF(D5:D16,"W") counts how many wins they had. As you have just seen, using COUNTIF function in Excel is very easy. 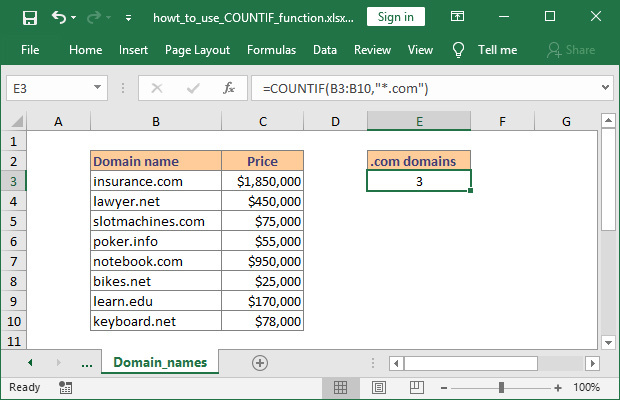 However, the flexibility of the function allows for many criteria, including wildcard characters for partial matching, named ranges, other cells references, and even the use of other Excel functions. COUNTIF is truly a powerful function which can be used in a wide selection of real-life situation. If you need to count cells with values greater than, less than or equal to a specific number, all you need to do is add the corresponding operator to the criteria. In this example I have used the named range points_scored (cells C5:C16). If you are using a manually inserted numbers (instead of a cell reference) you will need to enclose it in quotes "" along with the operator. =COUNTIF(C5:C16,">=100") – Counts all cells higher than or equal ">=" to 100. 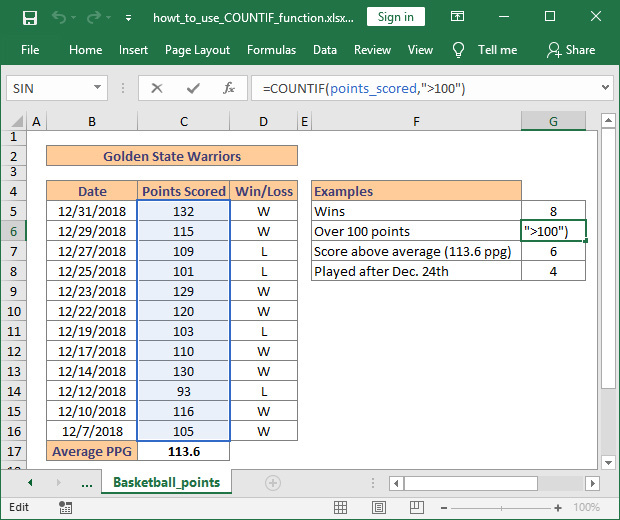 Learning the basics is important, but understanding how to use COUNTIF function in Excel along with other functions will yield great benefits. Below I have prepared two examples of how to use COUNTIF with AVERAGE and DATE functions. Please note the use of the ampersand symbol (&) to concatenate the operator with the criteria. Often times your Excel data will include variations of the words you want to count and using an exact match formula will not return the correct result. This is why learning to use wildcards with COUNTIF is so important. Basically, the use of wildcards allows you to count all the cells containing a certain string (word, phrase or letters). The use of asterisk "*" wildcard before and after the search term means that we want to count all cells which contain “Parker”, regardless of the position of this string (beginning with, ending in or in the middle of the text). If you need to match a single character, use the question mark "?" wildcard instead. The second example I have prepared demonstrates the use of wildcards to count all cells which have text ending with our search term. If you need to count cells which start with a certain string just move the "*" at the end of the criteria and you are good to go. For example, using “Dan*” will count all cells which contain the string “Dan” at the beginning of the text. This includes “Dan” but also variations such as “Daniel” or “Danny”. There may be times when you need to count the number of cells which are blank or the number of cells which hold data, regardless of their content. Counting blank cell is just as easy. All you need to do is use the formula =COUNTIF(range,””). The formula correctly handles numbers, dates and text values. I hope that after reading this article you have a much better understanding of how to use COUNTIF function in Excel. If you are looking to improve your skills even further, then you can check out more COUNTIF and COUNTIFS examples. Please let me know if you have additional questions by posting a comment. Understanding SUMIF and SUMIFS functions in Excel is easier than you think and provides great flexibility and increased speed when performing quick analysis.